Is it possible I really left my car unlocked and on for two hours while I was at an event? That was probably the worst on my list of horrible accidents I’ve managed to accomplish the last few months. I’ve have a collection of others: I left my oven on, burning squash (but thankfully not my house) when I went the museum. Another time I also left the stove burner on when I went away. I left my keys in the ignition (but the car off this time) and I’ve left my wallet in the unlocked car way too many times. The most recent time I left my wallet at home, Robeks made my son a free smoothie out of pity! Then, my kids and I have broken many a plate/frame/glass. I’ve left my kids shoes behind, jackets behind, everything behind. It’s a wonder I’ve never forgotten to get dressed, leaving my house naked (at least I haven’t–yet–as an adult)! It creates stress to not be able to trust myself to keep everyone and everything around me alive and well. My husband is always trying to help me implement systems to help me manage this and I tend to attract friends who are well-breed in the practical and safe. This conversation about the times I’ve nearly burnt down the house made me realized (again) how exhausting it is to be me. Or more specifically, how tiring it is to manage all of the careless, clumsy, forgetful, inept-at-survival tendencies I possess (DNA? Mommy-brain?). Sometimes I feel like it is wrong of me to pursue other things while being inept at the practical side of staying alive. Like, who am I to homeschool–being responsible for my kids’ education? 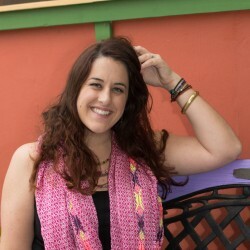 Who am I to manage organizations and projects to change the world? Who am I to teach or lead others when I start fires in my house? Who am I to be a writer when my teeth are way past help and I still haven’t made that dentist appointment? As you can see, that latter verse should be highlighted in bright bold red for us world-changers! This verse gives us the means to change the world. We can’t just do good projects, start cool programs, do random acts of kindness and/or give all our money away. That is all meaningless without the love. Love is the vehicle to change the world. This is big. A BIG, BOLD, RED ALL-CAPS type thing. That love is our vehicle should be the foundation, filter, and process we create for anything do-gooder and world-changing-ish. But it is more than our foundation–it is our relief. We aren’t all going to do cool crazy things highlighted in the world news. But we can love our package-delivery people, our friends, our circles, and even our neighbors far away. Also, it means even though I almost burn down the house, as long as I burn down the house with love, I am not nothing. Okay, maybe that is extrapolating a little, but as I tend to talk a lot about worth and my identity here, let me be honest. I don’t do everything (anything) perfectly. I destroy things I don’t mean to destroy and I am just not that careful, even when I try to be. 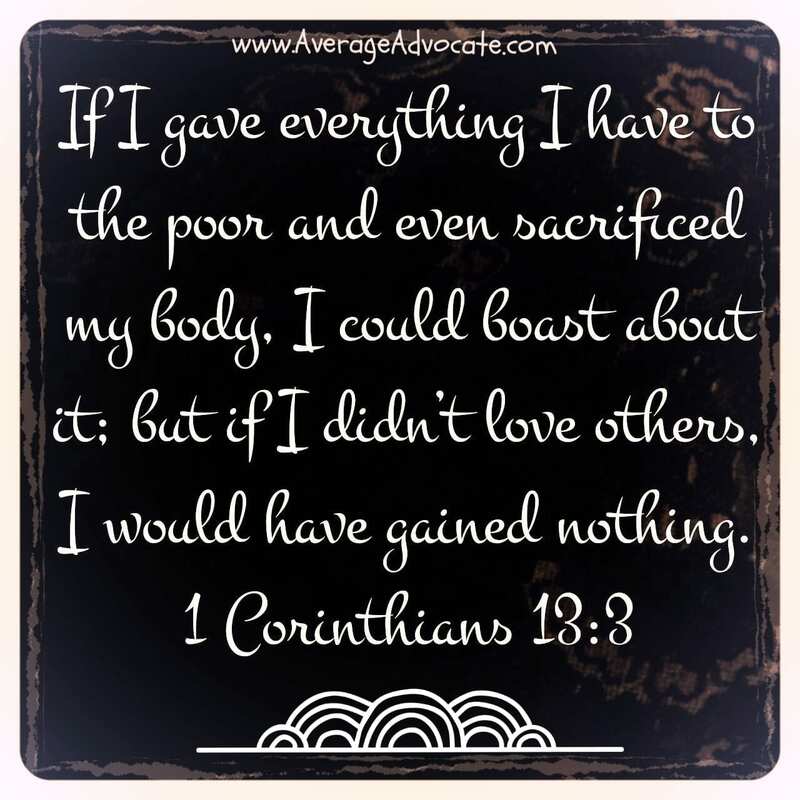 But my value isn’t condensed into whether my faith that moves mountains nor in my ability to sacrifice for the poor. My value is simply in love. I was and am loved. And now, I am able to love in return. 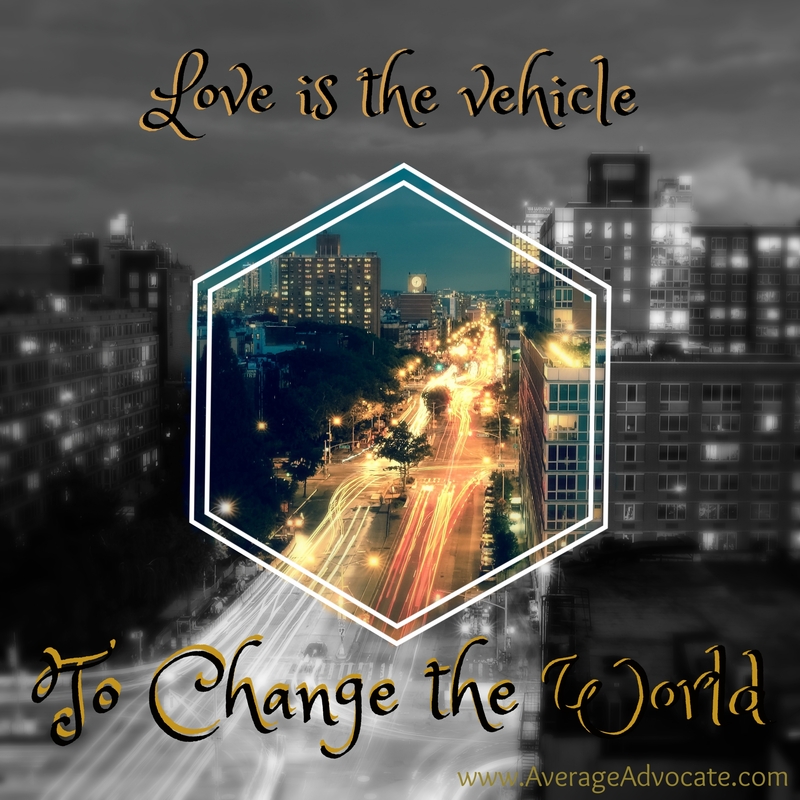 LOVE IS THE VEHICLE TO CHANGE THE WORLD!! !